commercial website - if you credit the source. All other rights reserved. The 1½'' pulley has been a part of the Meccano system from the very beginning, but often sadly ignored. It was originally part number 11, renumbered to 21 in 1909. The flanged wheel (initially 9, then 20), and the 1'' pulley (initially 10, later 22) were always used far more in models and outfits. Although it gained a tyre at the same time as the other pulleys, the tyre was never included in any outfits and thus remains scarce. Not until 1978 did it gain equal footing in outfits with the 1'' pulley, which explains why they are so common in the very late finishes. There were three main developments in the 1½'' pulley design. The very first MME and Meccano parts went through a bewildering sequence of styles with various numbers of holes. These were cast or milled solid brass, with a groove cut in the rim. Most have milled recesses in each side, making them recognisable as pulleys. With the advent of the "Meccano patent" boss in 1911, the pulley along with several other parts changed to a two-part pressing with separate boss. The two sides are held together by (normally four) smaller holes opened out in the style of an eyelet through larger holes in the opposite face. Again, many varieties are known, as can be seen from the table below. The finish is most often brass although there are nickel variants. Somewhere around 1920, the 'normal' design appeared, where the part was made from two identical pressings, each with two eyelets fitting into the other face. Both faces also have four plain holes, making a total of eight standard Meccano-sized holes round the pulley. This design subsequently went through all the usual phases: single and double-tapped brass, enamelled blue and red, blackened steel during the brass shortage of the Korean war, and then matt brass, light and dark yellow (rare), dark blue in 1978, and iridescent in 1979. 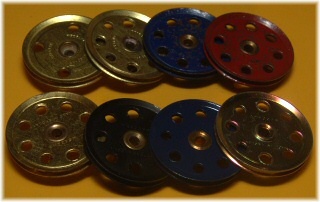 John Bader has pointed out a variation on the standard 1½'' pulley, shown as 23.br3b below, which appears the same as the single-tapped eight-hole version. In fact the four holes that are peened over are the same, but the four additional drilled holes are closer to the edge of the pulley, and so aren't at standard half-inch spacing from the boss. Is this a mistake or a common variant? Total number of messages on this page: 7. This is page 1 of 2. I've got one of the 21.br3b and it is smaller in diameter (1 7/16") with the preened holes being set further in than the drilled holes. The preened holes are 7/16" from the centre hole rather than 1/2". I've just picked up one of the 21.br3b types -- noticed it because it is smaller diameter than normal and came here to check. I can't compare against .br2a or .br2b never having seen these. I have three pulleys of the 21.br3b type reported by John Bader, and I know that John Martin of Kirby Moorside has several, too. Their four drilled holes are actually at the correct half-inch radius. However, they are only 1 13/32 inch in diameter, and it is the four riveted holes which are further in, not the drilled holes which are further out. They look exactly as though they have been made from surplus pulley halves from part 20.br2a or .br2b, because the diameters match, and the 21.br3b riveted holes are at the same radius as the 20.br2a/b drilled holes. Pictures of parts 21 and 22 in 1960s silver have now been sent. Thanks. I will try and get some pictures. So far, the flash and the zoom quality have precluded decent images. In the meantime, I can tell you that the parts are stamped "Meccano made in England" and that they are magnetic. The respective bosses are silver in colour and are non-magnetic. I remember seeing these parts coming out of new sets; one set purchased in 1969 and one new old stock in 1973.Meccano has been in the family for as long as I can remember! The latter set must have been a very late silver/yellow/black outfit because the half-inch pulleys were red plastic. Can anybody shed any light on the above? Was it a Binns Road exercise in cost cutting and, if so, why do these parts appear to be so scarce in silver?